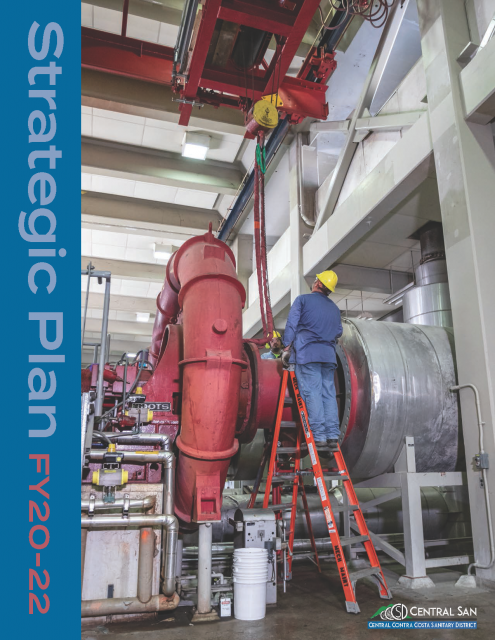 Here you will find current and past strategic plans, the Comprehensive Wastewater Master Plan, organizational and staffing plans, and a wastewater cost of service study report. 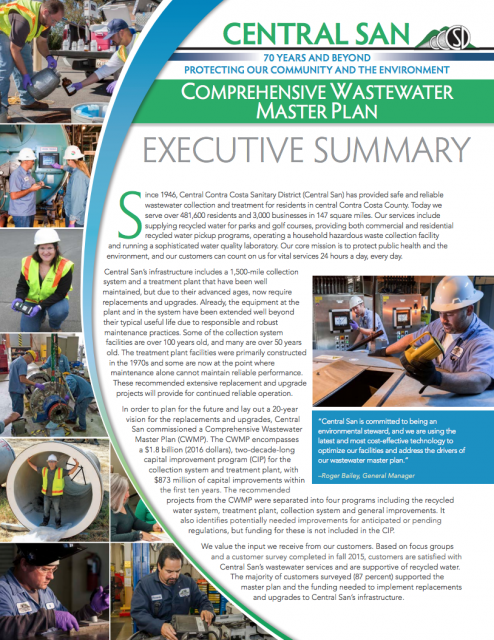 Since 1946, Central San has provided safe and reliable wastewater collection and treatment for residents in central Contra Costa County. Today we serve nearly half a million residents and over 3,000 businesses in 145 square miles. Our services include supplying recycled water for parks and golf courses, providing both commercial and residential recycled water pickup programs, operating a household hazardous waste collection facility and running a sophisticated water quality laboratory. 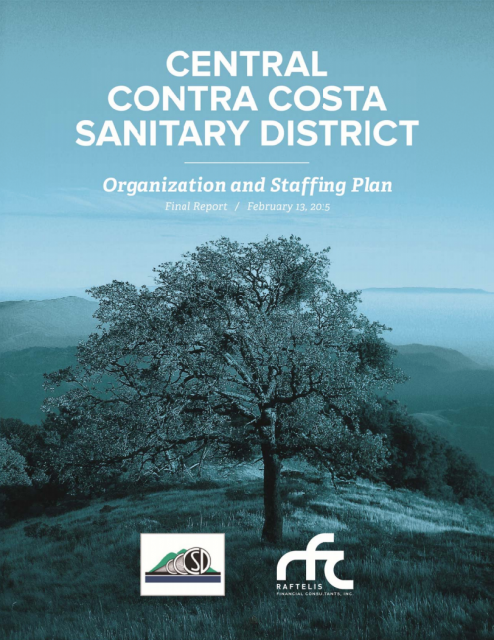 We are pleased to present the Central Contra Costa Sanitary District’s (Central San’s) Fiscal Year 2016-18 Strategic Plan. This Plan provides overall direction on how we will achieve our vision and mission to protect public health and the environment. Central San is a Special District of the State of California. Special Districts are local public agencies formed by residents of a community to provide a specific service. We provide wastewater collection, treatment and disposal services; recycled water production and distribution; and household hazardous waste collection. 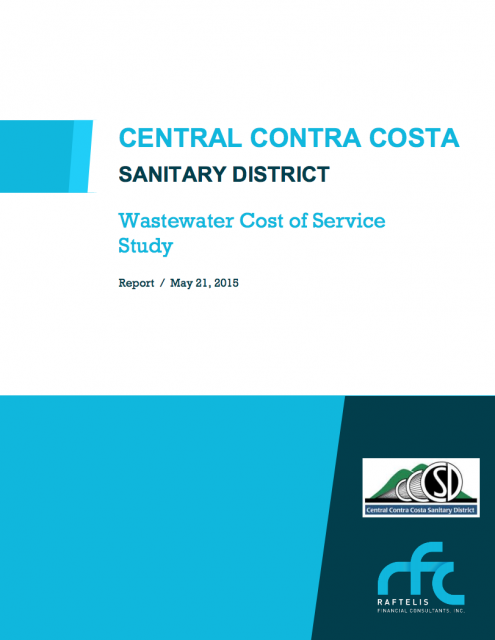 In June of 2014, the Central San engaged Raftelis Financial Consultants, Inc. (RFC) to conduct a comprehensive Cost of Service (COS) study to independently assess and evaluate the District’s existing wastewater rates to provide a fair and reasonable rate structure that enhances the equity of rates to ensure that there is a proportionate recovery of costs from the various customer classes. This report documents the study resultant findings, analyses, and proposed changes. As part of the Cost of Service study conducted by Raftelis Financial Consultants (RFC) in June of 2014, the District requested an organization and staffing needs assessment be conducted to define areas for organizational improvement and position the District to provide services in a cost-effective manner while positioning the organization to support a high-quality workforce and meet emerging regulatory wastewater/recycled water service objectives.